LOVE the colors and it fits my oversize king. love love love it! Stone Cottage Caldecott comforter set features stylized leaves and vines surround decorative medallions, creating a graphic damask in varying tones of grey on a white cotton ground. Panel cut standard shams with centered medallions add a custom look to complete this simple, yet elegant ensemble. I love that this set is a good quality cotton set. It does not make me feel overheated in the summer and it's not too feminine. The colors are light grey and blue and white which matched perfectly in my bedroom. It added a touch of summer and brightened everything up after such a long and dreary winter. 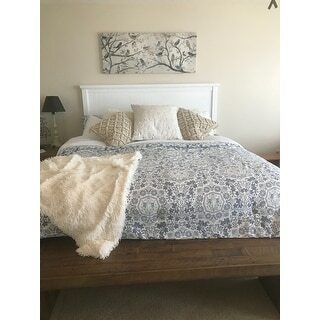 I absolutely love this comforter!! It is soft, and fluffy! The color is more of a light slate blue and grey on a slightly off white background. The pillow shams are soft and have a zipper closure that is very well hidden. The size fits perfectly on my king size bed with a nice overhang (which I have always had a problem with other comforters) love love love it! This is a perfect size for our queen bed. It's a high bed. The material is all cotton very soft and beautiful. Just as pictured with blue / gray on white background. 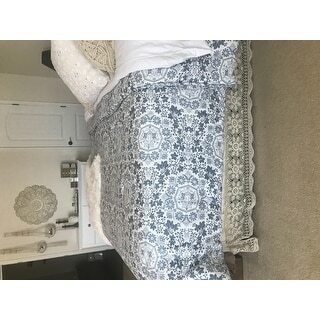 So happy with this comforter and shams. Will complete with a dust ruffle. Good quality and recommend highly. Absolutely love this comforter and the color. Ot matches my farmhouse decor perfectly.Quality is excellent. I was a little hesitant on it being white but it washes and dries nicely, so I dont have to worry about that!!! Buy this and you wont br disappointed. 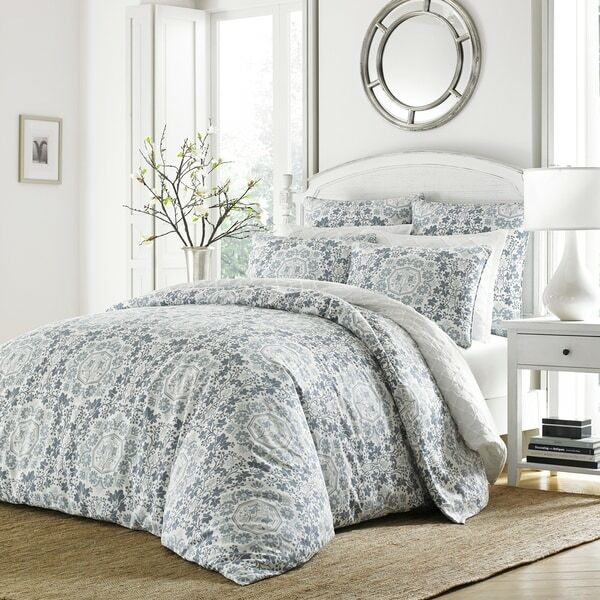 This is a great comforter set for the price! It’s a very pale denim blue and a soft gray. It’s soft and washes beautifully! I would definitely recommend this set. Good value comforter I'm happy with fill. It washed well and didn't come out lumpy which is a plus! I ended pairing this with striped sheets and the companion euro sized shams. I chose not to use the pillow shams as our sheet set fortunately came with 4 pillow cases. Love this comforter. The size is perfect for my queen bed and the quality is much better than other less expensive comforters I have purchased. Color is true to the picture, very soft and full comforter. It is exactly as advertised! The comforter is very warm and cozy yet light weight the quality of the cotton is just what I was looking for. It washes very well also. OMG! This set is so gorgeous. I love it so much. I was supposed to put it on my bed after the new bed was delivered, I just couldn't wait and I put it on the old bed. Will just take it off and put on the new bed once it arrives. I love this set. It is soft, both in texture and color. I thought the background was going to be more of a pure white, but I am still happy. The comforter is perfect for sleeping. It is the perfect weight and doesn't require an extra blanket. The material is soft and very comfortable. This comforter is so nice and warm. It complaments my grey walls perfect. "Is it really blue or grey?" It is gray with a slightly blue-ish cool undertone. "When will you be getting the King set back in stock?"